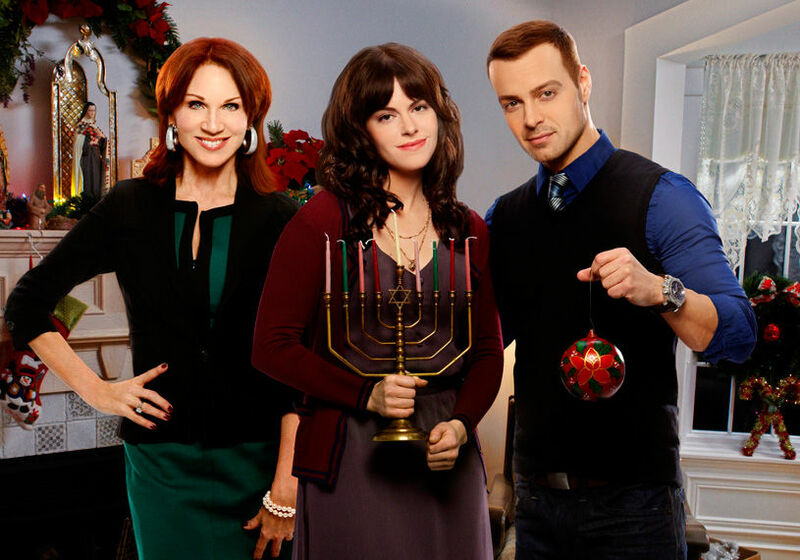 Marilu Henner (from left), Emily Hampshire and Joey Lawrence in "Hitched for the Holidays"
In 2019, Chanukah will begin the evening of Dec. 22 and end the evening of Dec. 30, which means that it will overlap with Christmas. This is a blessing in that much of the nation will be engaged in some form of joyous, simultaneous celebration. A rare thing these days. But it is also a curse because Chanukah is now on the radar of the Hallmark Channel. And now menorahs will be added to the mistletoe with two Chanukah-themed stories slotted for winter. It’s not the first time a Jewish character has been featured in a Hallmark holiday movie, though there are those who wished it was the last. In 2012’s “Hitched for the Holidays,” an Italian-Catholic man played by Joey Lawrence from TV’s “Blossom” and a Jewish woman played by Emily Hampshire from TV’s “Boy Meets Girl,” who is not Jewish, pretend to be a couple to placate their families, including her meddling mother played by Marilu Henner from TV’s “Taxi,” who is also not a Jew. In true Hallmark fashion, the two fall in love for real by the time the closing credits roll. These low-budget made-for-TV movies are loved by many because they are shamelessly romantic, extraordinarily wholesome and pleasantly predictable. They are ignored by many for the exact same reasons. In order to get a sense of what a Hallmark Chanukah would look like, so that we can plan our viewing or avoidance accordingly, I asked my cousin – a veteran writer of Hallmark and Lifetime programming – to help build a Chanukah-themed story out of the essential ingredients that drive every formulaic Hallmark Christmas movie. Hallmark holiday shows always seem to feature forgotten ‘90s TV actresses and once-hunky, now-obscure TV actors as the romantically involved couple. Thoughts on casting this Chanukah version? I’d go with a known made-for-TV movie commodity as the female lead, so that there is clear lineage between the “Countdown to Christmas” franchise and this new “Careening Toward Chanukah” installment. Lacey Chabert (“Party of Five”) is a favorite, having been in over a dozen Hallmark Channel films. Danica McKellar (“Wonder Years”) and Candace Cameron Bure (“Full House”) also have name recognition and could work. None are actually Jewish, which is apparently not a prerequisite at Hallmark, but I’d throw an Israeli actor into the mix just to cover our backs. A heartthrob like Aki Avni would attract Hallmark’s target demographic of women aged 25 to 54, only we need someone younger, less talented and more affordable since we are probably working with a budget of under $3 million. Let’s go with Danica McKellar, for no other reason than she was a teenage TV crush of mine, and an Israeli to be named later. Most Hallmark holiday movies tell the tale of a seemingly mismatched couple brought together by forces beyond their control. What about Danica and our Aki wannabe? Since English is a second language for our Israeli, let’s make it a distant second and use the language barrier as a vehicle for light comedy, some dramatic miscommunication, and something to be overcome so there is a final moment of true and heartfelt understanding and emotional connection. A Chanukah miracle! What brings them together? What’s their story? What if our Ari-lite and Danica met in Israel years ago, while she was doing Birth Right? They fell in love, she left, he has never forgotten her, and he has come to live in America to rekindle her affection. Sort of an Aliyah in reverse. Or, he is the brother of her dead husband – dead spouses are popular on the Hallmark Channel – and feels obligated to help her raise her children. Hallmark movies tend to have plenty of children on screen. Let’s give her three. Or, he is a widowed foreign diplomat with his children in tow during a mission in the U.S. Their plane is forced to land due to a snow storm. Local authorities ask Danica, the only Jew in this small town, to house them until the weather clears. Choose one. Either way, he’s in town for eight days and eight nights and they fall in love. A Chanukah miracle! Let’s go with the latter. What town? Hallmark gravitates toward fictional locations with homey, holiday-inspired names like Garland, Hollyvale and Homestead. For our story, I’d go with Gelt, New Hampshire or Little Dreidel, South Dakota. Sufganiyot, New Jersey is a bit of a stretch but certainly worth considering if Dunkin or Krispy Kreme is a corporate sponsor. How Jewish should we make this story? Hallmark “Countdown to Christmas” movies tend not to be too religious, preferring something spiritual or supernatural to make things right for a happy ending rather than anything particularly Godly. Intervention by elves was used in “Northpole” and its sequel, angels helped out in “A Heavenly Christmas,” and a storefront Santa worked his way into “A Wish for Christmas.” Perhaps a magical Mensch on a Bench makes a cameo appearance in our Chanukah story. A heavily bearded homeless man the locals call “The Rabbi,” who spouts seemingly non-sequitur wisdom while talking to himself, is another way to go. Let’s talk about production values. Or the lack thereof. These made-for-TV movies are typically made within a three-week window, so production values are limited though sufficiently attractive to maintain the Hallmark brand and holiday spirit. What would the promotional blurb on the Hallmark Channel website say about our made-for-TV movie? As families in the small town of Maccabi, Maine prepare for Christmas, a snow storm forces a small private plane to make an emergency landing. Its passengers – a widowed Israeli attaché and his three young children – are stranded on this first night of Chanukah until the weather clears. Local authorities call on Sara, the young woman who operates the one kosher bakery in town, to house them. Pastry and compassion overcome the language barrier between them and soon Sara’s house feels like a home. Elijah and Sara’s romance is foretold by the ramblings of an old homeless man who weaves his way through neighborhood trash cans, this story’s narrative and our hearts. Starring Lior Ashkenazi, Danica McKellar and Ed Asner. And what would be our movie’s title? Letters, commentaries and opinions appearing in the Cleveland Jewish News do not necessarily reflect the opinions of the Cleveland Jewish Publication Company, its board, officers or staff.